I’ve never had particularly great skin. Its gone through phases of good and bad, but unfortunately I’m in a pretty bad stage right now. My poor skin needs all the help it can get at the moment! I was using Lush’s Ultrabland cleanser and it just wasn’t cutting it for me. As much as I love more natural skincare, sometimes it just doesn’t do the trick for my troublesome skin. So, I went to Boots and picked up the Eucerin Dermo Purifyer Cleanser. Its aimed towards spot prone skin I believe, which is something I was looking for. I must say, I haven’t noticed much of a difference since using this, but I do think it calms my skin down, and it also feels really refreshing. Something else I like to use to help my skin, is The Body Shop Seaweed Clay Mask. This is an oil-balancing mask, so is great for combination/problematic skin like mine. I suffer with dry patches around my nose, but an oily T-Zone, so it can be a bit of a struggle. This really helps to make my skin feel normal for once, and softens it too. I did a whole review on it here if you’re interested. Now, lastly we have the Mario Badescu Drying Lotion. This is an odd concoction, but a brilliant one nonetheless. Basically, you have to dip a little cotton bud into the pink sediment at the bottom and then you pop that on any pesky spots. This has helped so many of my spots almost disappear over night, its magical. Now, it doesn’t always work as some spots are very persistent and just refuse to disappear, but for the most part this works pretty damn well. 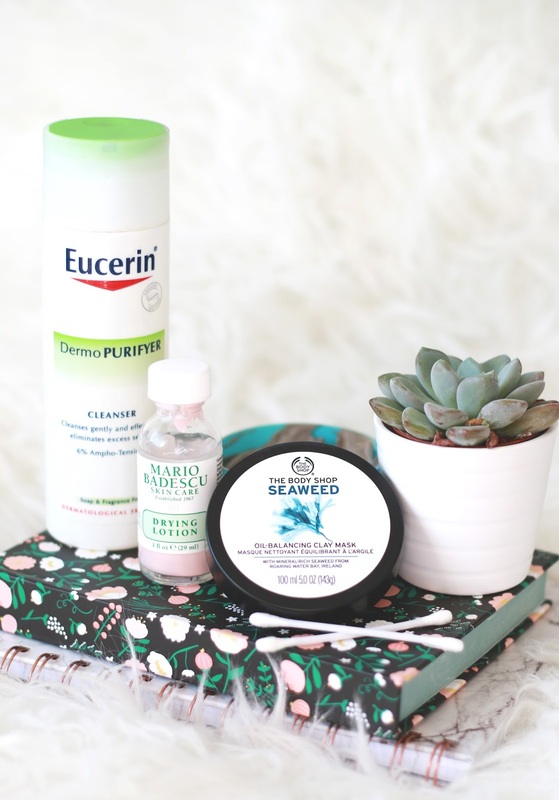 What products do you use to help with troublesome skin? Want to keep up to date with Forever September? Enter your email address to subscribe to Forever September and receive notifications of new posts by email.